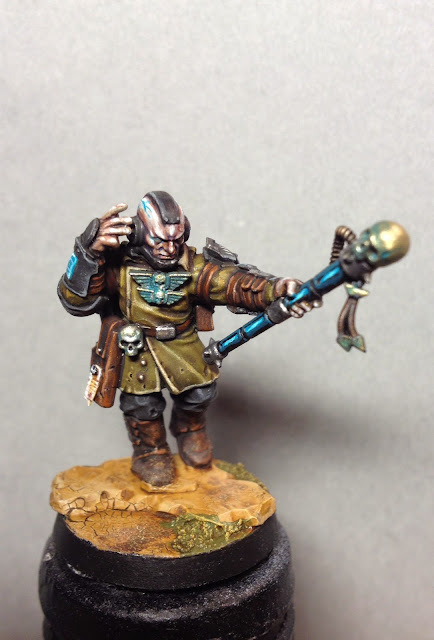 Here's the finished primaris psyker. Not that different from the last update. The base is done, some details and freehand stuff and I added a cable linking the wand to his arm to represent a psychic conduit doohicky of some sort. This has to be one of my fav's of your creations. Simple yet so effective on pose, sculpt and paintjob. Bravo. Thank you Dai. It seems I've hit something with this one... Finding the right pose does a lot for a mini. This guy is crazy cool. Bursting with 'wow-ness'! 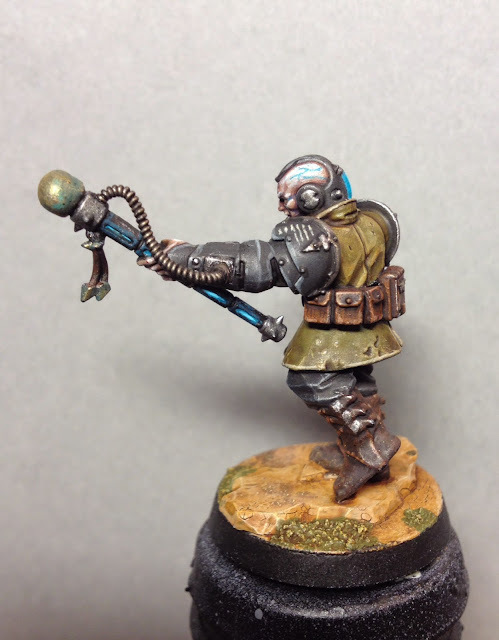 I find myself agreeing with Dai that this is probably one of your best conversions. The paint job is brilliant too and just makes the whole model seem alive. Terrific stuff! I'd be curious to know where that head is from, as I can't seem to place it. 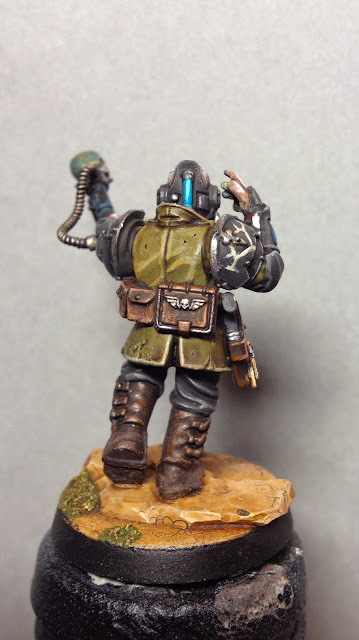 Another fine mini, great work. That is absolutely brilliant! Fantastic work, man. Hey Jeff, really love this conversion. Could you tell me what kits the legs and body are from? The legs are from a chaos cultist and the torso is from a IG tank commander. And thanks for the info about the heads. I'd never have guessed that they came from the Centurion kit. Might try and get some myself as they look quite neat on the right model! Cool model! The head is too big to my taste - and I have trouble seeing past that, but I love the paint scheme and the base. Might be cool if the eyes of the skull shone the same way as the rest of the staff's recesses. In a way I agree, but the classic image of a psyker is a guy with a big bald head - that was the look I was going for. I think this megaman head serves pretty well to conjure up that image. You´re absolutely right about the staff though. Just found your blog today and I'm instantly a fan. My painting style is very similar to yours and I must say you're inspiring me to start a blog. 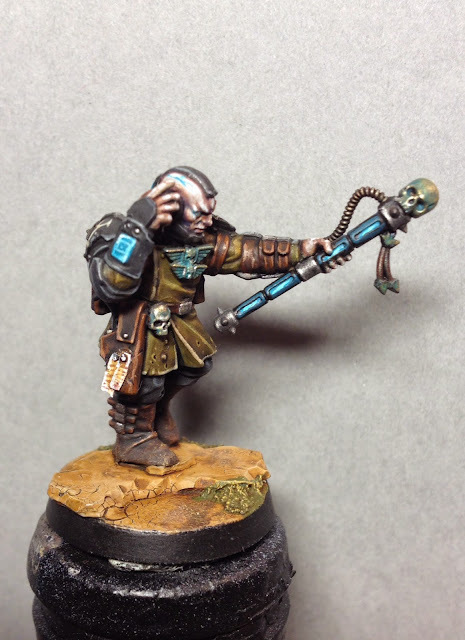 Also I just kit bashed my psykers this weekend using the scion arms as you did. Hope you don't mind if I still your centurion head idea. Great work look forward to seeing more! I´m glad you find it inspiring! Steal away! Great conversion and great paintjob! Really impressing! Could you tell me how you did the left arm? Don't think there's such an arm in the Scion-Box? Yes there is - the staff of something-something. I just added a wire linking it to his arm.